The Holy Week and Easter season focuses attention on the powerful Gospel accounts of the Passion and Resurrection of Jesus. The liturgies of the week, particularly Palm Sunday and Easter Sunday, are among the most well attended liturgies of the year. 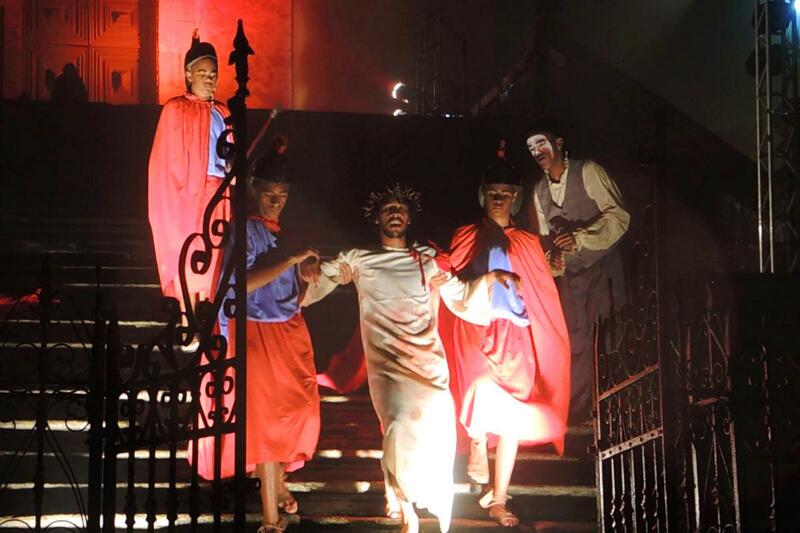 Throughout the week, in many cultures, an even grander scale spectacle of passion plays, processions and other reenactments tell the stories of Jesus’ final days. For Easter Sunday, many cultures have developed traditions such as Easter eggs, breads and other foods to signal the themes of resurrection and new life. In Eastern Catholic traditions, the feast is known as Pascha, or even, in the Greek Melkite tradition, as Holy and Glorious Pascha. In more northern countries, Easter comes at the time of year when spring arrives, but that connection is not a natural one in tropical regions and the southern hemisphere. In some cultures, Holy Week and Easter are the times when Catholic practice puts on its fullest public spectacle, filling streets and temporarily halting ordinary goings-on. Whereas in many non-Catholic cultures, it is the major Christian feast that is less publicly noticed or understood, in contrast to Christmas, even if the day is still a national holiday. Forty days of Lent (referred to as the Great Fast in many Eastern Catholic churches) lead up to the Holy Thursday commemoration, partially overlapping with Holy Week. In Spain and in many of the countries whose faith was shaped by Spanish colonial influence, penitential Holy Week processions are the time when the faith is most present and visible in the public sphere, and penance is a more prominent theme. The Latin Church sets the date of Easter according to the Gregorian calendar, while the Eastern Catholic churches sometimes celebrate it on the same date as the Orthodox, calculated according to the Julian calendar. In the late night and morning hours after Saturday night’s Easter Vigil, townspeople decorate the cobblestone streets with a tapete, or carpet, of colored wood shavings to mark the hilly, one kilometer route for the next morning's Easter procession. With 13 baroque churches, colonial architecture, and lush, steep terrain, Ouro Preto is a gem of a town, well known for its Holy Week observances, featuring no fewer than eight processions and special activities. At a huge, specially constructed outdoor theater about 200 kilometers west of Recife, the annual Paixão de Cristo – the Passion of Christ – reenacts the events of Holy Week on a scale befitting the biggest of Hollywood spectacles. Worship in the Tibetan and Naxi villages of the Lancang River valley entails two very different ways of praying — a rich and indigenized tradition of sung chant that is perhaps unique in the Catholic world, and an imported form of liturgical worship that at times seems to be not quite “at home” yet there. In Izalco, in Western El Salvador, the confraternity known as the Hermandad de Jesús Nazareno leads an overnight procession that brings thousands of people into the streets for that city’s biggest event of the year to commemorate Jesus’ Passion. In many cities in Spain, and elsewhere in the Iberian-influenced world, Semana Santa — Holy Week — is marked by major public processions that recount and ritualize the events of the Passion, providing a visual catechism and giving the masses a chance to participate in the story.